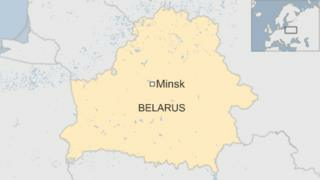 A young man has attacked people with a chainsaw and an axe at a shopping centre in Belarus, killing one woman and injuring another. Officials said the attack happened at the Europa shopping centre in the capital Minsk. Eyewitnesses spoke of a masked man chasing terrified shoppers on Saturday evening. Police later arrested the 18-year-old suspect. The motive for the attack was not immediately clear. "When he took out a chainsaw, shoppers first thought it was some kind of game," police spokesman Alexander Lastovsky told Reuters. "Then he cut one woman badly with the chainsaw and hit her with a hammer. She died. He also attacked others." The injured woman was taken to a local hospital. The attacker had brought the chainsaw and the axe to the shopping centre in a guitar case.